How do we become the best resource for young families in our communities? Can we really listen to their needs without a bias towards our own programs and initiatives? In today’s blog post, Liora Brosbe, family engagement officer at the Jewish Federation of the East Bay and a trained marriage and family therapist, shares her personal experiences in this space. 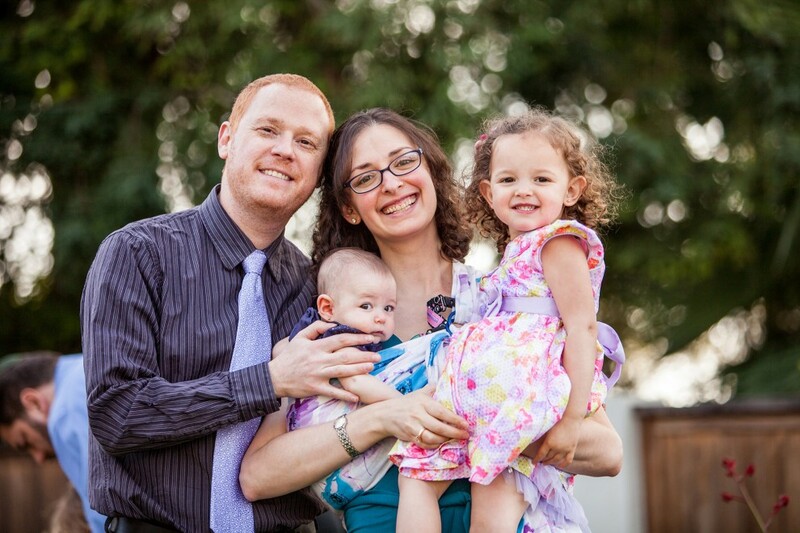 As part of her work with Sprout: Helping Jewish Families Grow Together, PJ Library and PJ Our Way programs in the East Bay, Liora guides families through the landscape of Jewish life in Northern California with a warm, relationship-based model that embraces the unique needs of every family she meets. It may seem like an unlikely combination: serenity and Jewish family engagement. The truth is, when I think of the big picture of family engagement, I think more about what’s hard about the work. At the risk of sounding negative, the work of engaging families in Jewish life is full of challenges, barriers, limited capacity, and the need for increased funding. So where does serenity fit into this picture? Serenity is possible when I focus less on my job and reflect instead on the work that I do. And the work that I do as family engagement officer at the Jewish Federation of the East Bay has many moments of serenity. I realize that mine isn’t the classic version of the Serenity Prayer attributed to Reinhold Neibuhr: “God, grant me the serenity to accept the things I cannot change, courage to change the things I can; and wisdom to know the difference.” My version applies to this work at a Jewish Federation that has many different aspects, many different folks with as many different styles of leadership, and many miles of geography that we are trying to serve, from the East Bay to Israel and abroad. My serenity is much deeper and has nothing to do with how I feel about my work, the tasks that I accomplish or the success that I experience in my professional capacity. My serenity is about knowing what I realistically can accomplish with the resources at hand, the focus to accomplish these goals with those resources, and the clarity to imagine what is possible. So many Jewish communities are competing for the same (limited) resources. These resources might be trainings, funding or families to attend their programs. In the East Bay we are so fortunate to have an incredible wealth of programmatic partners that offer diverse programs that attract all different folks. These include institutions that focus on nature and earth-based Judaism, innovative programs and religious services, engaging and thoughtful celebrations for the holidays, and thoughtful professionals who are planning and executing opportunities for families to meet in the park, in the social hall and on the farm. They have many competing demands for their time, money and emotional investment. They appreciate someone who is flexible, responsive and nonjudgmental. This is true for a solo parent looking for community and connection or a family of five looking for financial aid for summer camp. It is equally true for the Jewish educator of the supplemental school wanting to address the needs of existing families while also attracting new participants to the program. My background in community mental health has been essential to how I approach this work. I am not trying to change, fix or accommodate anyone’s “problem.” Instead, by providing supportive environments, relevant tools and authentic relationships, change naturally takes place. This is exactly what happens in this work of Jewish community. I don’t tell families what to do and how to do it but instead approach every family that I serve with the core belief that they will make the changes they are looking for with the right kind of support. I operate with the understanding that I may not have exactly what the family is looking for, but I can offer them my attention as well as a variety of opportunities that may meet their needs. Note: I do not ever suggest that a program will definitely meet their needs (or, God forbid, do I intend to be the one to meet their needs). A parent recently shared with me over coffee that her son was the only student of color in his Jewish day school class, and she highlighted her personal struggle over deciding to put him in a more racially diverse school setting. I responded authentically and thoughtfully. I didn’t try to convince her to engage in a specific way. My experience has taught me that this open and relatively objective stance is refreshing and helpful to the families that I serve. I do not tell families that Jewish engagement needs to be done in one specific way. I always tell them that they know their family best and that they need to do what is best for their family. This sometimes means that when Jewish preschool is unaffordable, as it is for so many families, I encourage them not to use Jewish preschool as a form of childcare (it is not necessarily synonymous). Perhaps they use a secular childcare provider and resources that cost no extra money: attend Shabbat services, read a PJ Library book, share a holiday meal with another family or watch some amazing content online such as the videos at BimBam. I also do not advocate for a specific program or community since Jewish life is a personal choice that is not “one size fits all.” I give families multiple options (but not too many) with the caveat that they should check out the referrals I make and I always invite them to come back to me to refine their search or to be a sounding board as they are making a decision. I am confident that the school, clergy or educator wherever they go will be a better advocate for their particular program than I would be. I know where my role begins and when it should end. I truly, truly listen. I don’t listen in the way that I’m waiting for my turn (I save that for my personal relationships, by the way). My academic training is in both improvisational theater and clinical psychology. I worked in community mental health with severely stressed families facing trauma, community and interpersonal violence, and poverty. Since I am a licensed marriage and family therapist, I can connect my skills of listening, attunement and mirroring to this background. These are invaluable if you want a family to feel heard and attended to. Curiosity! If families wanted to be Jewishly engaged and had the resources (time, money, connections), they would already be engaged. So, I am curious without being pushy. A great place to start is by asking what has worked for them in the past and what hasn’t met their needs. I prepare to be surprised, impressed and moved. I acknowledge their past challenges or barriers that they have identified. I don’t assume that being queer or LGBTQ or multiracial or married to someone who identifies as Jewish or not married at all are barriers for this particular family. I remember that they can be barriers but not necessarily for their specific family. When appropriate, I offer simple and concrete ideas for integrating Jewish engagement into their current lifestyle. These are often in the form of scheduling. When a family expresses interest in a specific synagogue, I recommend finding 4-6 consecutive weeks in which they can attend at least once per week. It can be for a family event, religious services, adult learning or a social action program. I recommend that they put it in their calendar so that it takes priority over the visit from a friend, the invitation to brunch or a last-minute outing. My recommendation stems from the idea that over the course of 4-6 weeks, a family will likely get the entire range of programming, see the regulars and become more visible to the clergy and staff that work there. I also offer email introductions between a potential family and my contact at the community partner. This point of contact should be the most responsive person on the leadership team and it could be a board member, clergy, administrator, educator or a parent with similar aged children. The key is that they be responsive to this form of introduction. This email is a simple but extremely helpful way to get the conversation started between a potential family and the organization. Clergy and staff are not intentionally unwelcoming, but with the many responsibilities they hold it may not be on their radar to welcome this family, especially if the family is not naturally proactive about introducing themselves. Another scheduling recommendation I make is that the head(s) of the household decide which activity they do each month and then put it in the calendar. Tot Shabbat every second Friday? Put it in the calendar! Musical movement at the library? Put it in the calendar and invite a few friends! “Going to Shabbat services” is too open-ended, has too many options, and can feel overwhelming. Instead making a plan to attend at a specific time and place is a great first step. Make it part of the family’s routine and schedule and soon they will anticipate it and it becomes a concrete step to becoming more engaged. Finally, Facebook. Instagram. Where are the families when they aren’t at home, at school or at work? They are on a device that brings them to the land of social media. I post Jewish books to buy/sell/trade groups to attract families that may be willing to get a free set of books for the family but don’t feel ready to looking to synagogue life. I send a private message to a parent posting on a parent-focused Facebook group asking about circumcision options. I lightly let the poster know I am available to share resources on the Jewish community. I created a Facebook group where Jewish families can ask each other questions about programs, products, and even housing. This is where the families are and it’s a tool, like any resource, that can be used for connection and facilitate relationships. Serenity is in reach if you can be clear about what you have in your community to help you connect with others. Great lay leaders? Fabulous development team? Marketing wizards? Use your resources, and know your limits. The key to serenity is thriving in that balance between the two.